With 1000's of assessments succesfully completed we are the lowest cost (£55) most efficient service on the web! 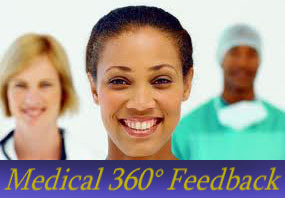 Welcome to the Medical 360° Feedback web-site from RMS. If you are looking to introduce 360° feedback (otherwise known as MSF) for Revalidation of medical staff, GP's or for managerial staff in your trust then we can help. We offer a complete service including a proven online 360 system combined with expert consultancy and training to help you implement the 360° process. We can also offer a full system for Revalidation which includes Annual Appraisal, Online Toolkit and 360 Feedback. Click here for more details. If you are just looking for a ONE OFF 360° feedback assessment for yourself or for an individual doctor just click here for more details. We also provide a specific 360 Feedback System for NMC Revalidation just click here for more details. Revalidation may be the driving force for introducing 360° Feedback for medical staff but there are major benefits your trust can gain from the process. Our consultancy team will help you create a practical implementation plan which links in 360° Feedback with the staff development process. Our online system has been designed in conjunction with University Hospital Southampton and the NHS Institute for Innovation & Improvement to meet the needs of busy healthcare professionals. The system is now also used by Royal Berkshire, Aintree, Moorfields, Portsmouth, Coventry and Luton and Dunstable NHS Foundation Trusts. Click here to see what University Hospital Southampton think of the system. The online forms used are based on the GMC Good Medical Practice Guidelines and the whole process is designed to meet the GMC Revalidation Requirements. The website is so simple to operate. You just choose the appropriate questionnaire(s) and buy a licence to cover the number of staff involved. The whole thing is run online on our servers so there is absolutely no IT investment required by you. We offer a cost effective online solution with expert consultancy to ensure your 360° process is a success. Prices are now just £55.00 per staff member assessed! To talk to someone about your project call us on 01923 775403 or click here to email us. Click here to learn about the basics of 360 feedback. Click here to see how to implement 360 feedback in your trust.